The following information is intended to help you get started with research for your CMNS 253 literature review assignment. If you do not find what you need, please Ask a Librarian or contact Sylvia Roberts, Liaison Librarian for Communication. My work week is split between SFU Vancouver and SFU Burnaby so the best way to reach me is by email. If necessary, we can set up a time to consult by phone or in person. See the box at right for my contact details. A literature review helps you identify scholarly research landscape that pertains to your topic. Conducting a review or survey of previously published research on your topic will provide you with information as to what research has been done, types of questions asked, methodologies used, subjects studied, findings, theoretical approaches, etc. Malikhao, P., & Servaes, J. (2011, May). The media use of American youngsters in the age of narcissism: Surviving in a 24/7 media shock and awe – distracted by everything. Telematics & Informatics. pp. 66-76. doi:10.1016/j.tele.2010.09.005. You can search for books or articles using the catalogue search box on the Library homepage. Enter the title enclosed in quotation marks to find exact matches. Results will include any sources that include that phrase, including the article and any books or articles that cite that article. 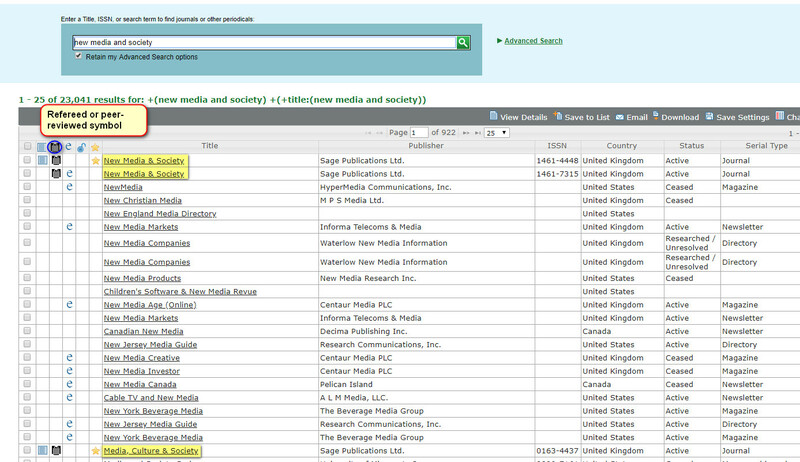 Use an article index to search by topic and get results in a variety of different academic journals. Search using terms that describe the major concepts involved in your research. When you find a relevant record in your results, scan it for leads that you can use to improve your search strategy, such as search terms you haven't used or expert authors. For example, if you search for the terms used as subject headings, you will identify all records in that database that focus on that specific topic. Computers are a literal technology. Though you & I understand that "text messaging" and "text messages" are conceptually related, digital search systems will search only for the term you enter. Library databases often gather records on a topic under a specific subject term that describes the topic. Searching Communication and Mass Media Complete for "text messaging" finds 500+ records which include that phrase anywhere in the record, e.g. in the title, subject, abstract. When I review these results, I see that relevant records include the subject term "text messages (phone systems)". If you don't find anything on your specific new medium (because it's too new or because no one has done the research), consider research about media that shares characteristics with your focus. Scan the subject headings suggested for your resulting records, often linked from a sidebar. You can also use the author's name to search for other research they have done. Often academic researchers work on related research questions over the course of their career. Useful perspectives on new media can be found in sources such as statistical reports, information published by industry or trade associations and news articles, as well as scholarly sources. When you find information on a web site, use the "About" link to discover who maintains the site, whether they have the qualifications to post credible data, whether they have financial or political interests that may bias how the information is presented, etc.